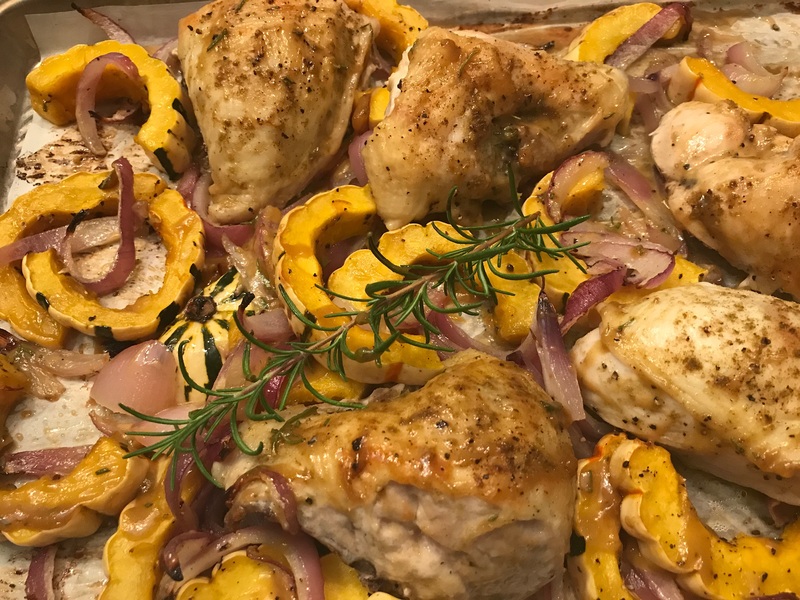 Who doesn’t love a delicious, nutritious and quick weeknight sheet pan dinner straight from the oven? 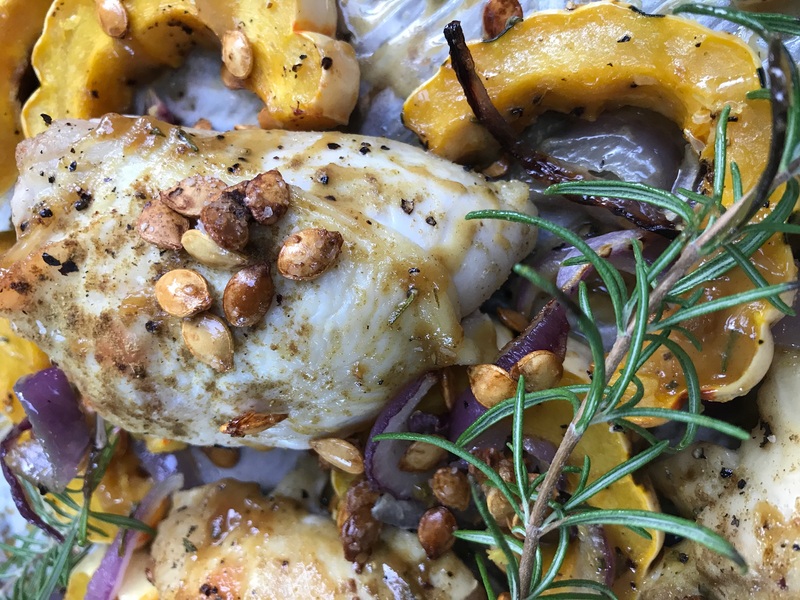 This chicken dish boasts seasonal slices of delicata squash, caramelized onions and a fabulous maple-mustard-rosemary finishing glaze. 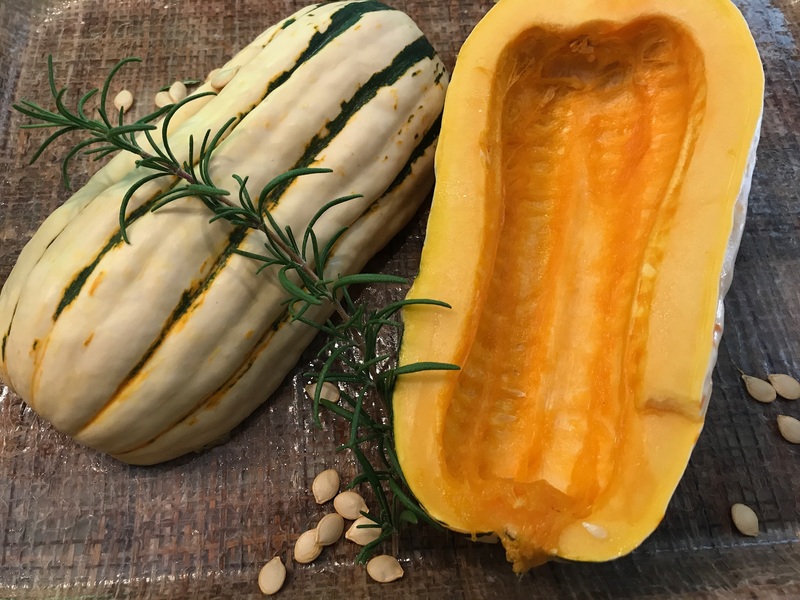 The deliciata squash is so pretty when sliced and with skin that can be eaten, simple to prepare. It holds up well to roasting and cooks in the same amount of time as the chicken. I toasted the squash’s seeds separately and tossed them over the whole dish at the end for added crunch and nuttiness. I used chicken breasts but you could substitute chicken thighs. So good with easy clean up to boot! 2 bone-in, skin-on chicken breasts, each cut in half. Line a sheet plan with foil or parchment paper for easy clean up. Pat the chicken breasts dry. Season the chicken with salt, pepper and cumin, to taste, and place on the sheet pan. Toss the squash and onion slices with 1 tablespoon of the oil. Season with salt and pepper to taste. Scatter evenly around the chicken. 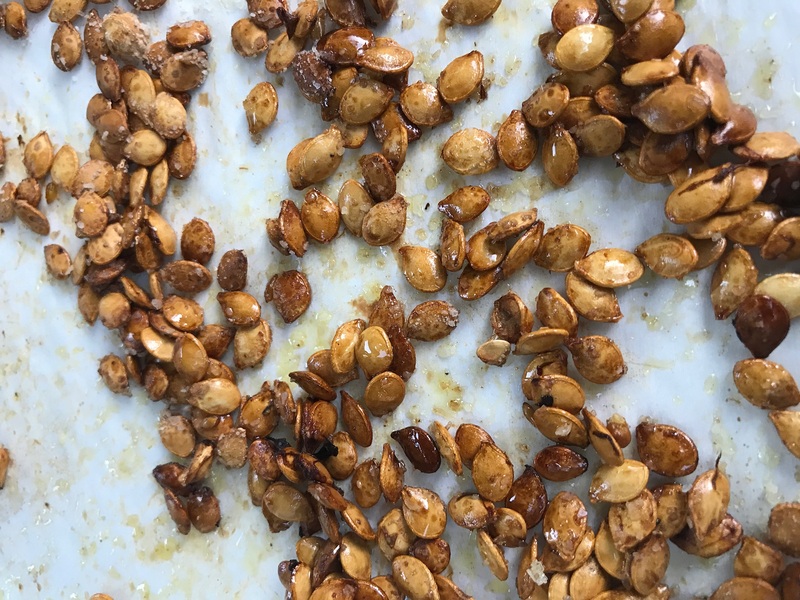 Clean the squash seeds of membranes. Toss in 1 tablespoon of oil. Sprinkle with a pinch of sea salt. Spread in a single layer on a second baking sheet. Place the chicken on the bottom rack and roast for 45 minutes, stirring the vegetables mid way through. Roast the squash sheets on the middle rack for 30 minutes. To make the glaze: mix the last tablespoon of oil, the rosemary, the maple syrup and the Dijon together in a smalll bowl and brush over the chicken and vegetables. Return to the oven for an additional 5 minutes of cooking. If you want more caramelization, place under the broiler for 3-5 minutes, watching carefully to prevent burning. Serve with the roasted squash seeds sprinkled on top. 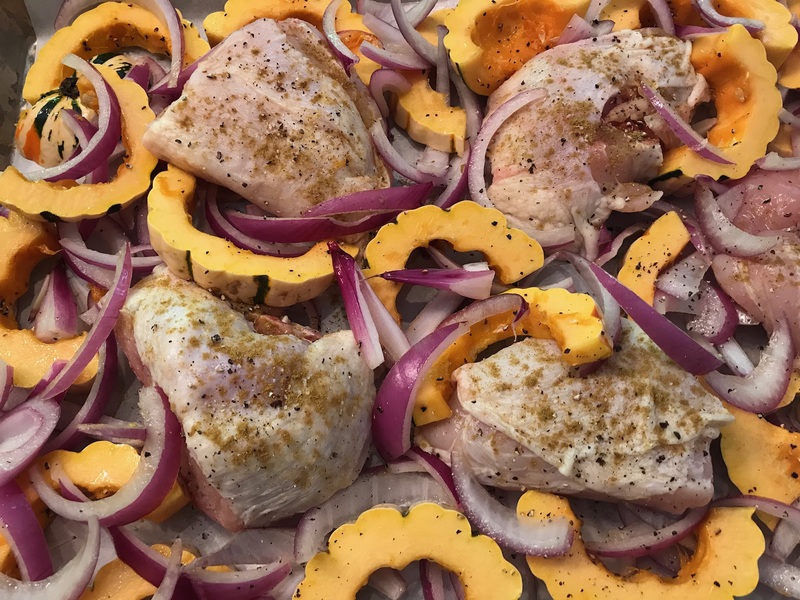 This entry was posted in Recipes and tagged delicata squash, sheet pan chicken breasts, Sheet pan chicken with delicata squash, toasted squash seeds by Johanne Lamarche. Bookmark the permalink. What a wonderful fall feast Johanne! I know that sheet pan dinners are all the rage, and I have yet to try one, this is a sure winner! I am pretty much drooling 🙂 Your painting is fabulous! Thanks Jenna! That painting is a surprise for my son’s 22nd birthday next week. 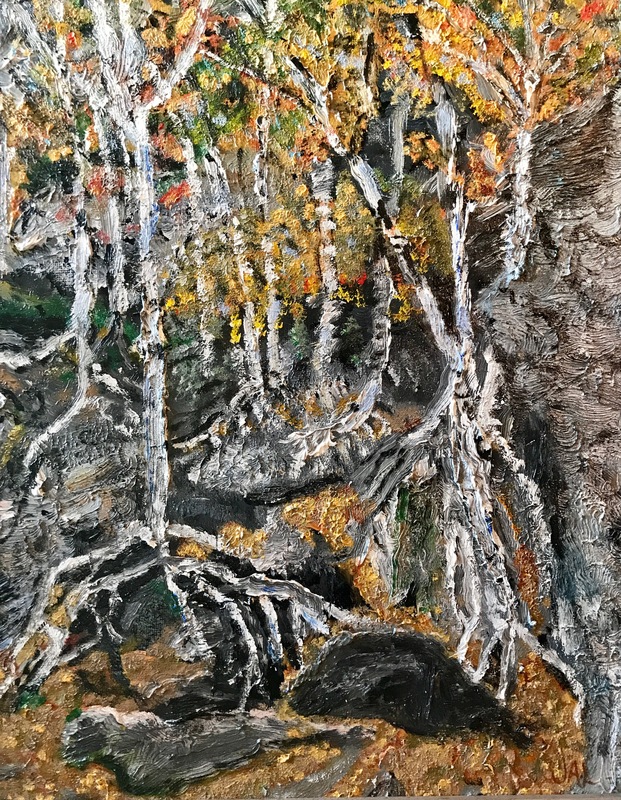 We did that hike on his 21st birthday last year and I painted it from a photo we took. I loved those Harry Potter-like Birch roots growing out of the rocks! You will love the ease of the sheet pan dinner. We have all been making them for years I think. For some reason I didn’t get a good browning of the chicken on this new pan I used but the dish has tremendous flavor and hopefully your oven will get that chicken skin nice and crispy! Beautiful painting to close your fall recipe. I want to explore the texture of the paints with my eye and hand before making the tempting meal.